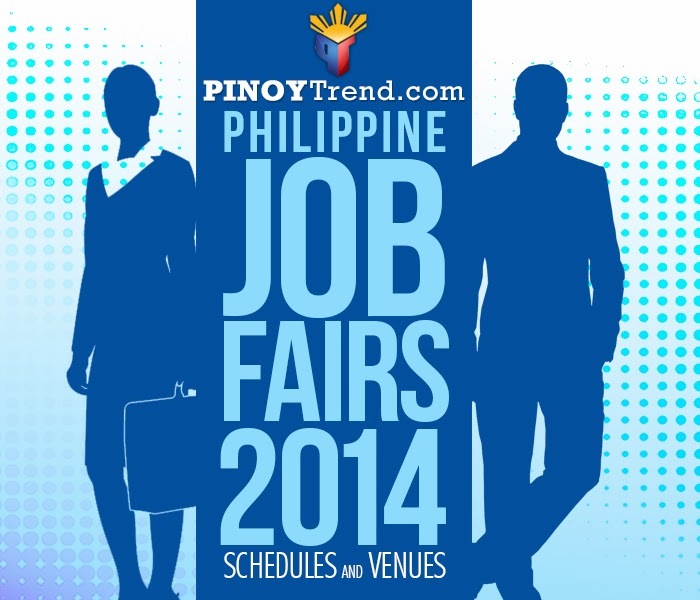 Philippine Job Fairs 2014 Schedules and Venues is enlisted here for Jobseekers who wants to take advantage of all the opportunities being offered by different companies from a wide range of industries. Career fairs or job fairs are becoming more popular here in the country as more Filipino seek opportunities for employment. It's always been a good option to include these activities in your search for job as you can have easier access to employers at a convenient location such as malls or conference centers. Here you will meet representatives from your target companies and know more about their career opportunities as well as specific details on current open positions. Organized by: Magnus Event Inc. Organized by: Magnus Eventus Inc.
Should you have more career opportunities for our jobseekers, please feel free to Contact Us. We will be glad to have your own Job Fair be posted here. Be part of SM City Sta Rosa Run: Yolanda Fund Raising Project on March 15, 5AM at the SM City Santa Rosa Front Parking. You can register at Run For Love booth located at the Ground Floor in front of Dairy Queen from February 15 to March 14, 2014. Participants must run in thier RED Shirts! See you there! You can visit SM City Sta. Rosa Facebook page for more details and latest updates. 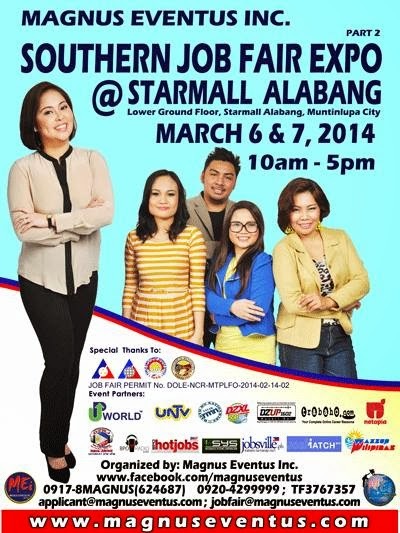 Update you resume and you are invited you to grab this career opportunity!Join the Magnus Eventus Inc. at 2nd Southern Job Fair Expo @ Starmall Alabang, Muntinlupa City on March 6 & 7, 2014 from 10am-5pm. There lots of available positions from different participating companies to choose from. Hi trail-runners out there! The one of the most-awaited trail run races in the country is back! as the Salomon, the #1 brand in trail running will once again presents the SALOMON X-TRAIL PILIPINAS 2014. The Hamilo Coast will be the race venue with 2 race categories: Road to Trail Runs & Mountain Runs. The said event race will be the 4th Annual Race for Salomon in the country. Just Save the date and Register Now! 24km & 32km Mountain Run. Registration starts on February 15, 2014. Hey Jobseekers! 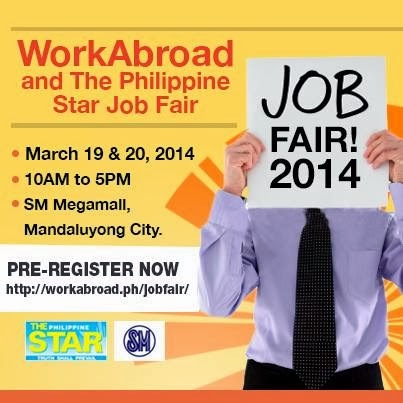 Come and join the WorkAbroad & The Philippine Star Job Fair on March 19 & 20, 2014 at SM Megamall, Mandaluyong City from 10:00am to 5:00pm. Pre-registration is on-going. Just visit www.workabroad.ph/jobfair. Update your resume and be part of a company where you can best utilize your skills. 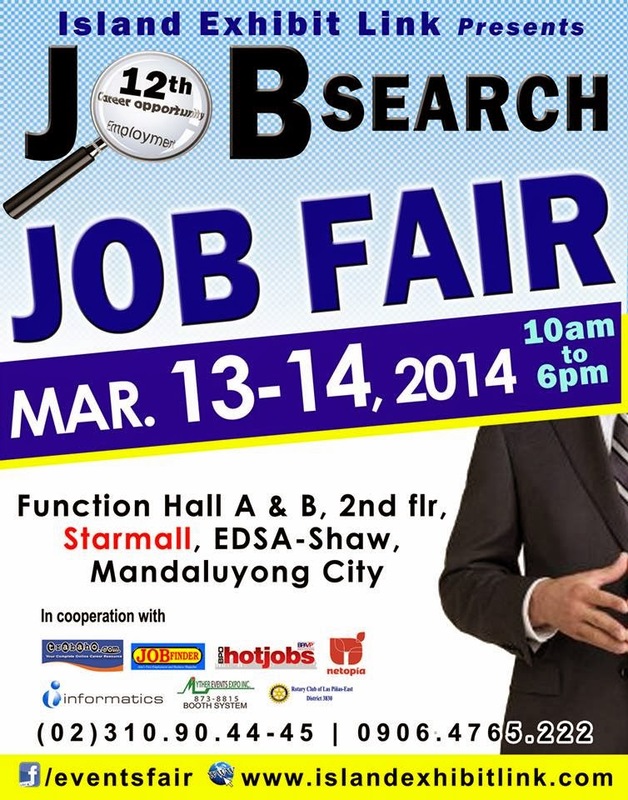 Get ready and update your resume as the Island Exhibit Link presents the 12th Job Search - Job Fair 2014 on March 13 and 14, 2014, from 10am to 6pm, at Function Hall A & B, 2nd Floor, Starmall, Edsa-Shaw, Mandaluyong City. There are arrays of companies from different industries to choose from. Hi there Pampaguenos! come and join the Metrobank One Big Heart Run on March 1, 2014, 4:00am, Saturday at Metrobank San Fernando Main, Tiomico St. City of San Fernando, Pampanga! 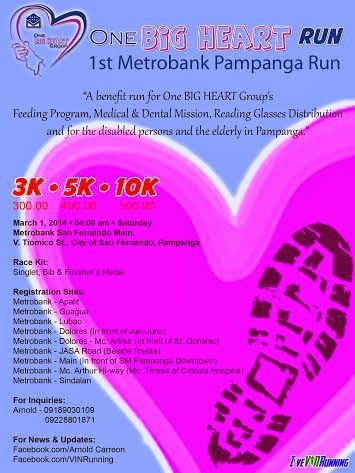 the fun run event is the 1st Metrobank Pampanga Run and for the benefit of One BIG HEART Group's Feeding Program, Medical and Dental Mission, Reading Glasses distribution and for the disabled persons and the elderly in Pampanga. Register Now! Get ready to once again break the SUB-1 10K time limit in 2014! 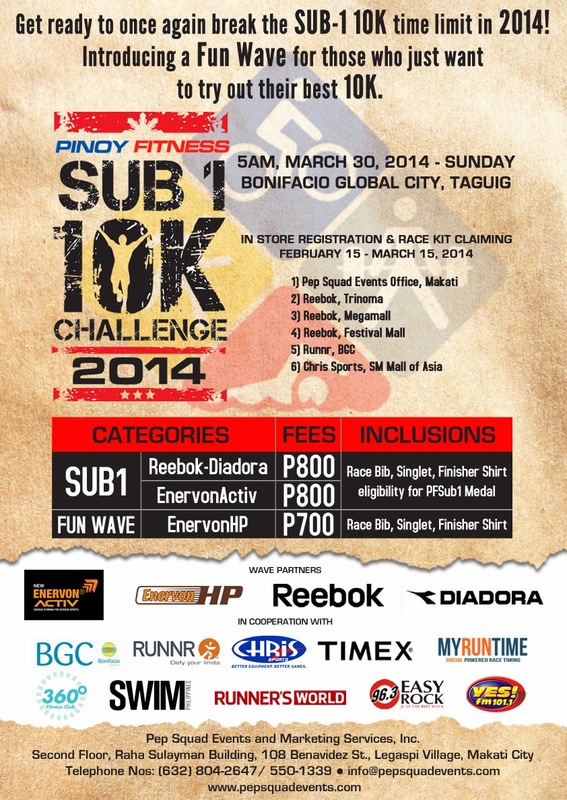 Come and run with the Sub-1 10K Challenge 2014 on March 30, 2014, Sunday at Bonifacio City Taguig. Experience with the 10K Fun Wave perfect for those who just want to try out their best 10K. Be part of our Events! Register up now! Hey Shoppers! 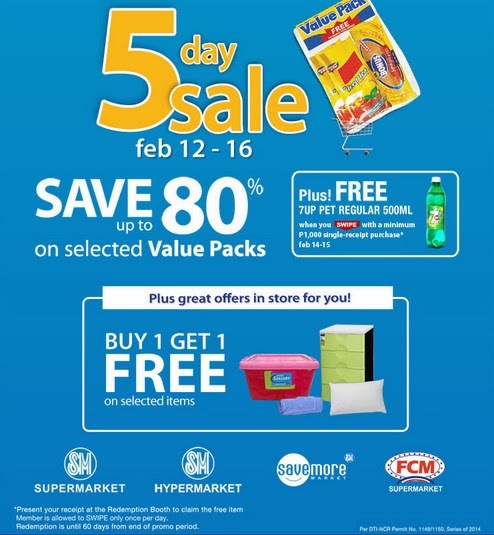 Bring your SM Advantage card and enjoy the SM Value Packs 5-Day Sale on February 12-16, 2014 at selected SM Supermarket, SM Hypermart and Savemore mart and save up to 80% on selected Value Packs! Plus, get a FREE 7UP PET Regular 500ML when you swipe with a minimum P1,000 single-receipt purchase* on February 14-15, 2014. *Present your receipt at the Redemption Booth to claim the free item. Member is allowed to Swipe only once per day. 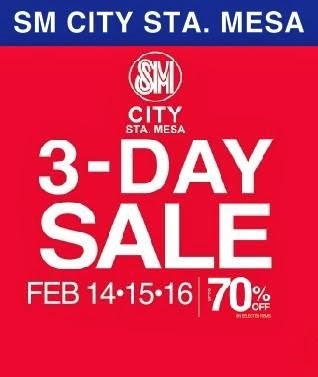 SM City Sta Mesa will be having 3-Day Sale and all set to roll out this year! Kicking off this February 14-16, 2014, enjoy up to 70% off on great selections! See you there and happy shopping! Come and join the Run and Save Life 2014 will be February 16, 2014, Sunday, 4:30AM at Provincial Capitol Lagoon, Bacolod City. 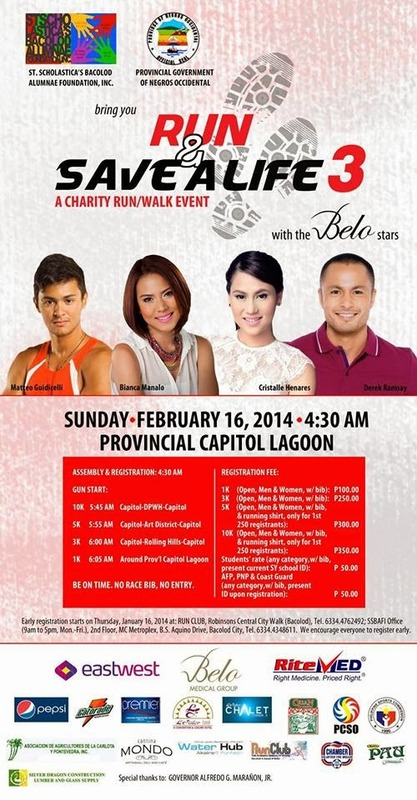 This is your chance to join the run or walk with the BELO Stars such as Matteo Guidicelli, Bianca Manalo, Cristalle Henares and Derek Ramsey. Register Now! Get a Singlet for the first 250 registrants for the 10K and 5K run. Inclusive of race bib and refreshments. Register Now! Join the fun once again and get ready in The Color Manila Nite Run 2 on February 22, 2014 in Filinvest City, Alabang. Assembly time is at 6PM while gunstart is set at 8PM. Registration fee for all categories is Php 850. The Color Manila Nite Run 2 includes a Nite Race Shirt, Glow Eyeglasses, Glow Sticks and a Finisher's medal. Registration ongoing until February 12, 2014, Register Now! Prepaid cards are now available at selected SM Cinema, Runnr Stores and Toby's Stores. Register now at www.colormanilanite.com. See you all on February 22! Visit www.colormanilanite.com for more details and COLOR Manila RUN Facebook page for the latest updates. 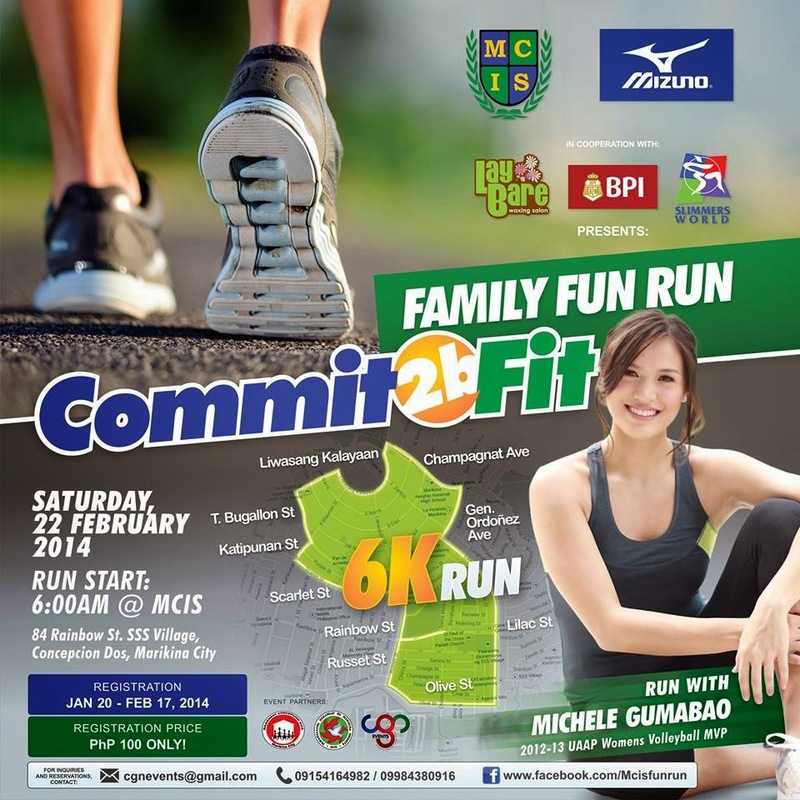 Come and join the Commit 2b Fit Family Fun Run 2014, the first ever Fun Run in a route never been done before in Marikina City! Let us all join together and Commit 2b Fit on February 22, 2014 and run a 6K with Michelle Gumabao (2012-2013 #UAAP Womens Volleyball MVP)! Fun Run is open everyone! Registration/Reservation is only from January 20 - February 17, 2014 only! Register Now! This perfect opportunity to accomplish your first 6K or improve your time for a future race. Visit Mcisfunrun Facebook page for more details and latest updates. Another Fun Run With Mary 3rd year Anniversary Celebration, running has become a trend in Santiago City, young and old, professionals and amateurs engage in this sport. However, more than being a craze and a reason of health fitness,people sign up for running races to advance a cause. 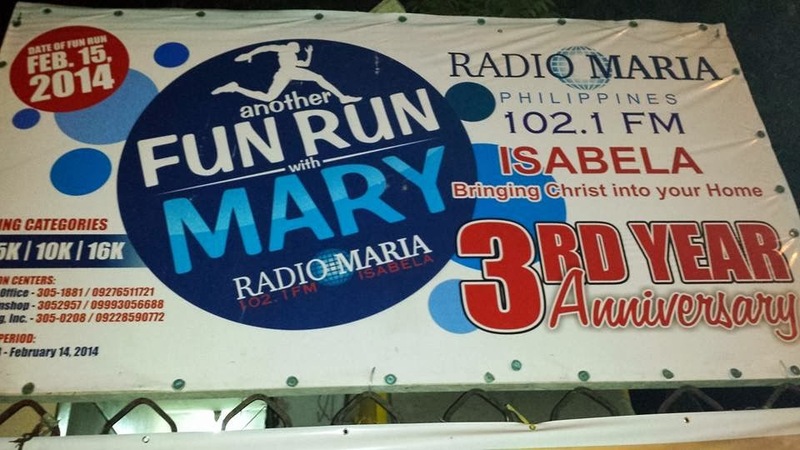 The Radio Maria 102.1 FM is taking this interest to unite brothers and sisters and their families through a walk/run for Mary and healthy families dubbed as "Another Fun Run With Mary" on February 15, 2014. Visit Another Fun Run with Mary Facebook page for more details and latest updates. Get ready and gear up for the Wall 2 Shotgun 10-mile Challenge 2014 that will happen on March 23, 2014 5am at Divine Mercy, Guitnang Bayan 1, San Mateo, Rizal. Lots of exciting prizes, gift packs and cash prizes awaits top runners of the said event. 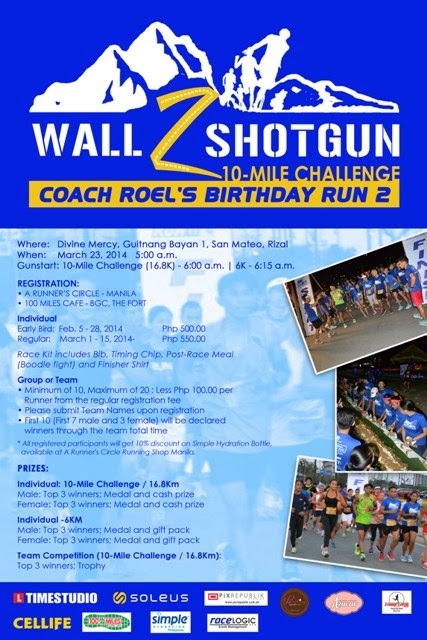 The Wall 2 Shotgun 10-mile Challenge is the 2nd year of Coach Roel’s Birthday Run. *All registered participants will get 10% discount on Simple Hydration Bottle available of a Runner's Circle Running Shop Manila. Don't miss the fun! See you there!